Seven Brides for Seven Brothers (1954) is the first musical I can remember being shown. My babysitter had it on VHS, and I'm sure we gave that tape plenty of use. Based on anecdotal evidence, I'm not alone. Seven Brides is a childhood favorite of many -- and often has been the gateway drug that opened up the world of movie musicals to countless impressionable minds. The combination of the film's colorful photography, catchy (if not quite classic) songs, inventive choreography, and gleefully goofy characters continue to impress six and a half decades after the film's initial release. 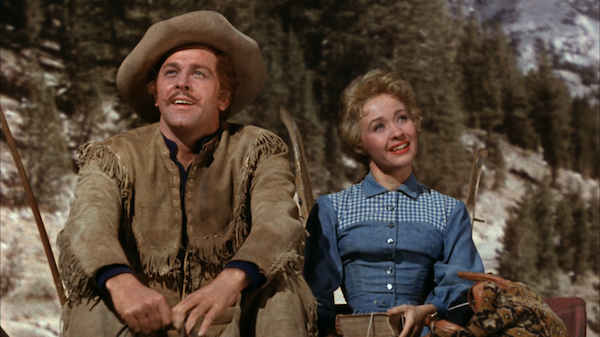 Howard Keel stars as Adam Pontipee, a red-headed backwoods farmer in mid-1800s Oregon. Adam is first seen bringing his wagon into the nearest town, in search of a wife to cook and clean for him and his six isolated brothers. As Adam's opening number, "Bless Her Beautiful Hide," makes clear, it wouldn't hurt if she was a looker either. When Adam espies Milly (Jane Powell) serving up food with a dash of sass to a bunch of rowdies in the local tavern, he figures he's found himself a suitable housemaid-- er, life partner. He proposes to Milly, who is duly impressed by Adam's unhewn charm. She marries him that day -- not realizing that her days of cooking for crowds of rowdy men are not quite over. You see, back at the farm, there are six more red-headed Pontipees waiting, named in alphabetical order, from the Bible: Benjamin (Jeff Richards), Caleb (Matt Mattox), Daniel (Marc Platt), Ephraim (New York Ballet Company's Jacque d'Amboise), Frankincense (call him Frank -- or else; he's played by Tommy Rall), and the youngest, Gideon (Russ Tamblyn, before Twin Peaks or West Side Story and already a charmer). To say these boys don't know how to behave around a lady is putting it lightly. Adam can barely get through the introductions before the boys start brawling; they attack Milly's first prepared meal like feral animals, fighting over a fresh kill. After significant growing pains, Milly starts teaching the Pontipee boys about civility and how to woo some women for themselves. This culminates in the film's centerpiece, a beautifully choreographed dance-off at a barn raising, between the Pontipees and six of the slicker fellas from town, in hopes of wooing some of the local young ladies (played by future Catwoman Julie Newmar [credited as Julie Newmeyer], Nancy Kilgas, Betty Carr, Virginia Gibson, Ruta Kilmonis, and Norma Doggett). Choreographer Michael Kidd allows the number to play out across the construction site, with men flipping and tumbling all around wood planks, sawhorses, and other hunks of lumber. It's a series of acrobatic feats that make for a visual treat. The next turn of the story is the one that might give younger first-time viewers pause. Depressed at the prospect of spending a long, cold winter without seeing the ladies they like, the Pontipee boys are convinced by Adam to follow the example of the Romans who abducted the Sabine women (or "Sobbin' Women," as Adam calls them). The Pontipees go into town and kidnap "their" women, evading the angry townsfolk by triggering an avalanche on the trip home. During the secluded winter, love -- or maybe Stockholm syndrome? -- gradually performs its magic, and the six new couples begin to form. I'll try not to be "that guy" here, arguing that some favorite bit of outdated pop culture doesn't deserve to be viewed through modern eyes if those modern eyes will just make the thing I like look bad. But I will simply state, as a mitigating factor, that the Pontipees are indeed sexist dunderheads, and that the sexism and the dunderheadedness are arguably the major flaws that their characters are shown to grow out of, as the film progresses. No doubt viewers resistant to patriarchal attitudes might still bristle, but this cast and crew works on such a high level of craftsmanship that it's easy to get swept up in the wonder and joyfulness of it all. Director Stanley Donen and choreographer Kidd work beautifully together and would work again shortly on It's Always Fair Weather (an underrated personal favorite). The script is credited to Kiss Me Kate's Dorothy Kingsley, as well as the veteran married writing team of Albert Hackett and Frances Goodrich (The Thin Man, It's a Wonderful Life). The photography by 13-time Oscar nominee George Folsey is rich and colorful, complimented by the vivid costumes by Walter Plunkett and the soundstage art direction of Cedric Gibbons and Urie McCleary. Whether you want to relive old memories, or make some candy-colored new ones, Seven Brides for Seven Brothers should do the trick. 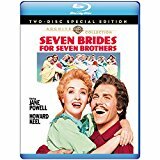 Seven Brides for Seven Brothers comes in a two-disc set, essentially reproducing the 2-DVD release from 2004. The first disc contains the restored Cinemascope presentation and the bonus features, while disc two contains the alternate "flat" version of the film that was shot as a precaution against cinemas being unable to project the anamorphic prints (similar to the two versions of Oklahoma! that were shot in two different formats back-to-back). In videophile circles, it's fairly well-known that Seven Brides was deemed a lost cause, since the original elements have been badly damaged over the years. However, this AVC-encoded 1080p 2.55:1 presentation, sourced from a new scan of a recently discovered interpositive, is going to have most fans of the film quite pleased. Colors are vibrant and stable. The digital image is clean, with no significant dirt or damage to report. Certain stretches (beyond just the titles and obvious opticals) are sourced from dupe footage, which makes for a less crisp look. Overall, though, clarity and detail are strong. This DTS-HD MA 5.1 surround is a lossless version of the surround remix done for the DVD. The musical numbers feature the most obvious separation, with the songs by lyricist Johnny Mercer and composer Gene de Paul given a big boost in presence. Dialogue and effects are well-supported. A satisfying bump up. One subtitle option: English SDH. Commentary on the release version by director Stanley Donen - "I'm not supposed to like it, am I? Well, I do like it." Ported over from the old DVD, this commentary is refreshingly forthright. Donen discusses the difficulties in getting the film made, overcoming the lack of faith from the studio and the film's producer, to complete a beloved hit. Some quiet gaps as Donen just watches the flick unfold, but this is overall a worthwhile listen. Sobbin' Women: The Making of Seven Brides for Seven Brothers (43:25) - A retrospective talking-heads doc that interviews much of the cast and crew about the production of the film. This doc reportedly originates from the 1997 laserdisc, but this version is the extended cut from 2004 that includes added interviews with Jane Powell and Jacques d'Amboise (their footage is shot on video, while the rest of the doc appears to be shot on 16mm film). Newsreels (4:01 total) - A look at the film's New York Premiere, plus a photo op for MGM's 30th Anniversary. Both segments are narrated using interview pieces recorded for the "Sobbin' Women" documentary. MGM Jubilee Overture (HD, 9:44) - A CinemaScope short of Johnny Green conducting the MGM Symphony Orchestra through a medley of the studio's best-known tunes. A nice piece. Fans of this film had given up hope on a proper HD upgrade, but Warner Archive Collection has delivered. This joyous, colorful musical treat is handsomely remastered and nicely supplemented. Highly Recommended.